The CASP exam for CompTIA’s certification is a welcome departure from the standard test format in that it challenges candidates to grapple with real-world scenarios to test foundational knowledge. With the first significant update since 2013, NIST 800-63-3 brings a modern and flexible approach to digital identity that serves the mission needs agencies are facing today. Enhance your identity management program for FISMA, RMF and more. TalaTek, LLC Becomes FedRAMP 3PAO Accredited. 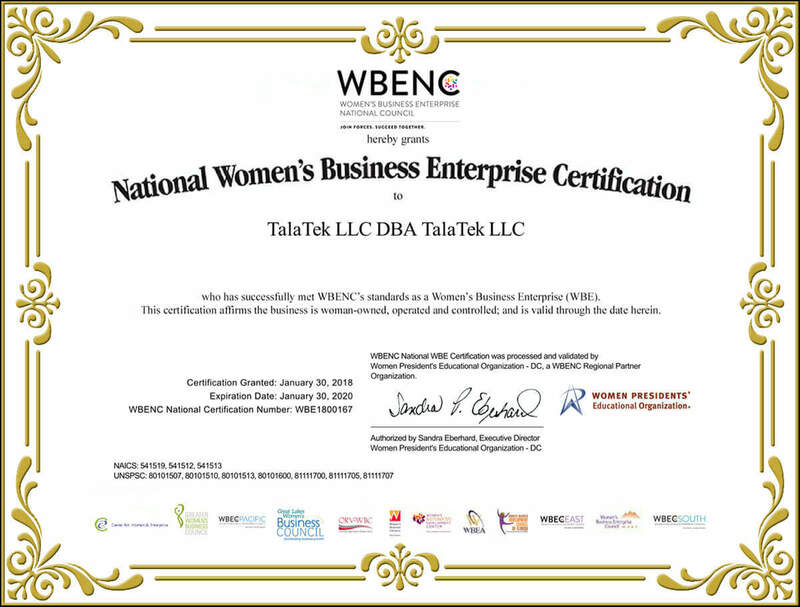 February 15, 2015, Oakton, VA – On February 11, 2015, TalaTek, LLC, a woman-owned small business (WOSB), providing specialized managed-services in risk management, security and compliance, became an accredited FedRAMP Third Party Assessment Organization (3PAO). Baan Alsinawi, TalaTek founder and president, featured presenter at ISACA Governance, Risk and Compliance conference. On October 21, 2014, ISACA held an all-day conference on Governance, Risk and Compliance (GRC) in Arlington, VA. The conference was created to provide CIOs, risk-management groups, system administrators, and security and audit professionals the opportunity to explore and discuss new trends, perspectives, solutions and leading practices. Inaugural Internship Program Member Becomes Full-Time Team Member. TalaTek’s inaugural Internship Program member becomes a full-time team member. Brian Thiellen is the first Junior Information Assurance Consultant to join the TalaTek team after completing the TalaTek Information Security Continuous Monitoring (ISCM) Internship Program. TalaTek is pleased to announce the launch of the inaugural Information Security Continuous Monitoring (ISCM) Internship Program, and is proud to welcome Brian Thiellen as the inaugural member of the TalaTek ISCM Internship Program. The Internship Program provides entry-level information security personnel with a unique opportunity to gain valuable Information Assurance (IA) professional experience. This hands-on program is designed to mentor and cultivate upcoming IA professionals based on the TalaTek methodology.